Founded in 1999 and operated by Paysafe Financial Services Ltd, Neteller is one of the longest-serving and most popular e-wallet solutions for online gambling. Accessible in 28 different currencies, Neteller is available in more than 180 different countries and in 16 different languages, including English, Arabic, French, Spanish, German and Russian. Neteller can be used to make international transfers, securely spend money online and make use of prepaid card services. When it comes to betting on cricket matches, the most important features are the ability to instantly transfer money and receive payments, however – as well as those secure online payment systems. Furthermore, should you ever experience problems, Neteller provides excellent 24/7 assistance. What currencies can be used with Neteller? Then you are ready to start depositing money for your cricket betting needs on Bet365 and Betway. Choose your desired deposit method. 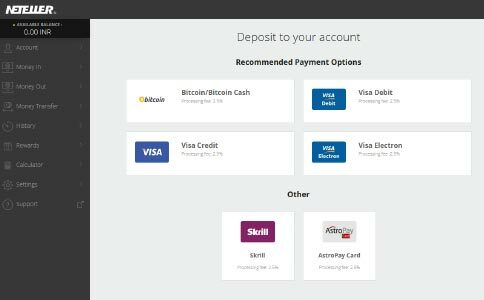 There are a vast range of deposit methods available, from VISA cards to International Bank Transfer, to Bitcoin, WebPay and Skrill. A full list of deposit methods is available on the Neteller website. 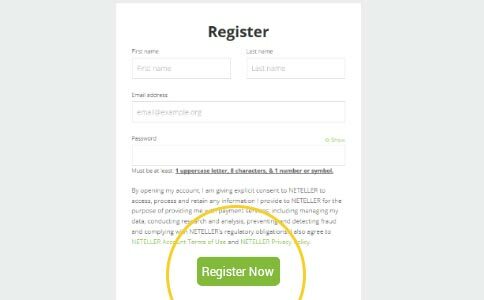 After checking the information, simply click Confirm and your money will be deposited into your Neteller account ready to use. All of the available deposit methods carry a fair, low-price 2.5 per cent fee. The fee is universal no matter which of the deposit methods you select or the currency used. Bet365 offers some of the best markets on cricket tournaments such as the IPL, Big Bash League and Pakistan Super League, as well as the Ashes and the Cricket World Cup. There is no fee for using Neteller to upload funds to your Bet365 account, and it is easy to link the account. When logged in to Bet365, simply head to Deposit and select Neteller from the list of available payment methods. Providing that is the case, however, you need to enter your Neteller account number or email address and your six-digit Neteller secure ID the first time you wish to transfer funds. Once you have done so once, the details are saved to your account to make it swifter to deposit money directly to Bet365. Using Neteller to bet on cricket with Bet365 is free and instant, while there is a limit of between 10USD and 37,500USD. Bet365 consistently offer good prices on a range of markets including Top Team Batsman, Top Team Bowler and their own Performance Points market. As with uploading funds, one of the main advantages of withdrawing money using Neteller is the speed and convenience. Accounts must be verified in order for you to be able to withdraw funds, but once you have completed the verification process it is easy to withdraw your winnings. Choose your preferred withdrawal method – bank transfer, wire, money transfer or merchant sites. Neteller offers their own cards too (see below). Confirm to release your profits from betting on cricket matches into your bank account. 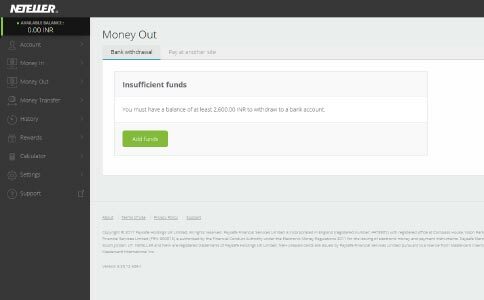 There are some small fees involved with withdrawing money from your Neteller account, which is the trade-off for the security and convenience the service offers. There is no fee for withdrawing to a merchant site, however – so your money can be uploaded to your Bet365 or Betway account for cricket betting with no extra fee. In addition to being able to withdraw direct to your bank account, Neteller also offers two different Prepaid cards – which allow you to make payments direct from your Neteller account. The Net+ Prepaid Mastercard is available to Neteller users with a verified account. Select Net+ cards from the left sub-menu and confirm your mailing address. Once the currency and the PIN have been checked, you can select Confirm and the Net+ Prepaid Mastercard should arrive within 2-10 business days, giving you instant access to your cricket betting winnings when out and about. Neteller charges a €10 shipping/handling fee, which will be withdrawn directly from your Neteller account. 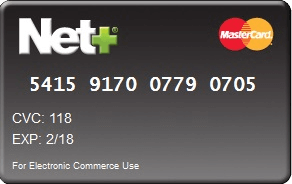 The other Neteller prepaid card available is the Net+ Virtual Prepaid Mastercard. Again, it is only available to verified users and can be accessed from the same sub-menu as above. This time, select Net+ Virtual Cards and then Add a Card. The first card is free and included with your account while further cards are subject to an administrative fee. Complete the form, including your preferred currency – again, sticking to your Neteller account currency will cut out exchange fees – and a card name, as well as an optional lifetime limit. Why should you use Neteller to bet on cricket matches? First and foremost, Neteller is a safe and secure option if you are looking for an e-wallet solution to betting on cricket matches. Safety measures include SSL encryption so you know your money is safe, whether you are betting on the latest Indian Premier League fixtures, the Cricket World Cup or the Ashes. All transactions made using Neteller are monitored 24/7, both electronically and by live security agents too. For uploading money to your cricket betting accounts, Neteller is unquestionably one of the safest methods available. Neteller is also very easy to use, thanks to the fact it provides instant funding – making despositing money into your Bet365 and Betway accounts for betting on cricket matches super convenient. Trusted by millions worldwide, you simply need to register for an account, choose your deposit method, upload your funds and they will be available to back match winners, top batsmen, top bowlers and more. Neteller also have a mobile app, available to download from the Apple App Store or on Google Play. The Neteller app makes it even easier to use, allowing you to check your balance and upload and withdraw funds. 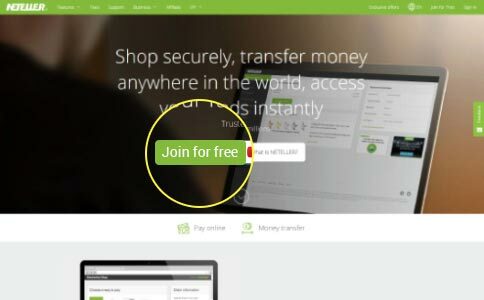 Neteller also offers a range of incentives to customers – if you use it regularly, with high turnovers, you will qualify for the Neteller VIP membership. So, if you are using it frequently to bet on cricket matches across the globe, and profiting from the range of markets available at Bet365 and Betway, you can get further rewards with Neteller. They are in the form of points earned for every Neteller transaction. Neteller Reward Points can be exchanged for gift cards, cash or even sporting goods to accompany your sporting bets. The VIP programme also opens the opportunity to become a VIP ambassador – earning further rewards for referring others to become VIPs.